Thus far, we’ve completed the first 14 letters of the alphabet. (Check out our previous “Who Dats”: Unknowns beginning with the Letter A, Letter B, two pages for Letter C (here and here), Letter D, Letter E, Letter F, Letter G, Letter H, Letter I, Letter J, Letter K, Letter L, Letter M and Letter N.) We even have one of buttons with pictures only — no names. That’s even harder to decipher. 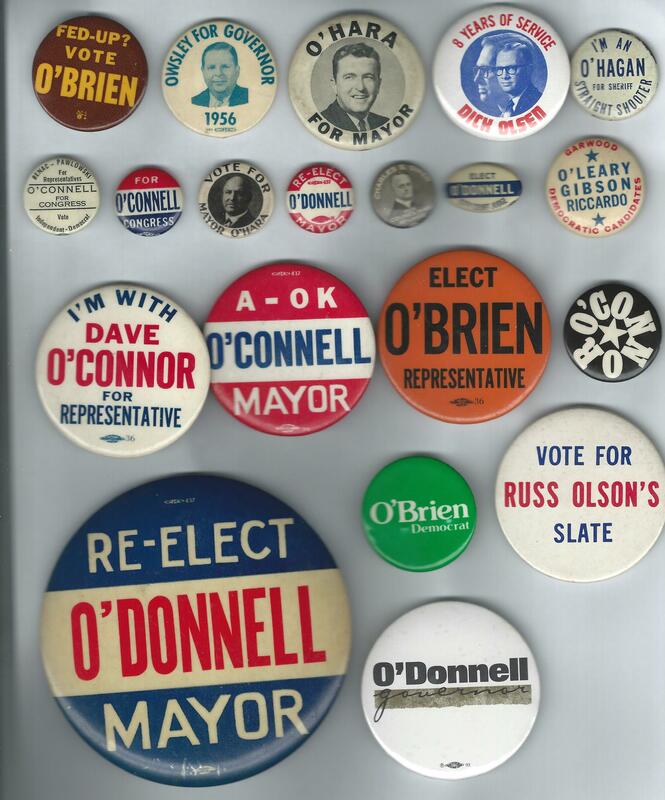 ROW 3 — The first button may be from Boston in the 1950s. We had a mayor named Charles S. Owen in 1932-33, maybe it’s him. Sorry, that’s all I got. The O’Donnell Governor is a 1994 PA piece….Democrat. Richard, which one are you responding to?